Toho Company, Ltd. the producer of twenty-eight GODZILLA motion pictures, and Diamond Comic Distributors, the world’s largest distributor of comics, graphic novels and pop-culture merchandise, have reached an agreement that will bring the best GODZILLA merchandise from Japan and beyond to the United States and Canada. Diamond will choose, market, and distribute the highly desired and sought after GODZILLA toys, comics, collectibles, and lifestyle products, many of which have previously been available only in Japan. An initial round of merchandise is featured in Diamond’s May PREVIEWS catalog, and is expected in retail stores starting in July. 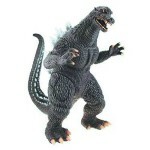 To pre-order GODZILLA merchandise, find a comic shop near you at www.comicshoplocator.com or call 1-888-comicbook. Retailers interested in purchasing GODZILLA products are encouraged to contact Diamond’s New Accounts Department at newaccounts@diamondcomics.com. Read on to check out what Godzilla toys Diamond has in the May 2013 catalog!